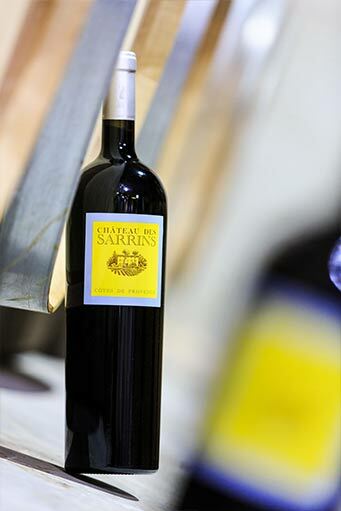 Domaine des Sarrins derives its name from the word “Saracens”. For centuries, Saracens occupied the Massif des Maures, from which they launched raids into the surrounding region. In the 11th Century, during one of these plunderings, they met with some resistance and a chief Saracen was wounded at Draguignan. Whilst trying to reach the Massif des Maures he died at this place where he owned a small tower. He was said to have been buried in his armour, made of gold. Over the centuries all around this Saracen tower, which subsequently became a country estate, were precious resources and a domaine was established. Many trades were practised here according to the changing cultures, from olive groves to livestock to silk worms and of course …. vines. From the end of the nineteenth century and again from the First World War, the rural exodus considerably weakened the countryside, and the domaine became smaller. In 1995, the Paillard family bought it and by working patiently, over the years, have infused a new sense of life. 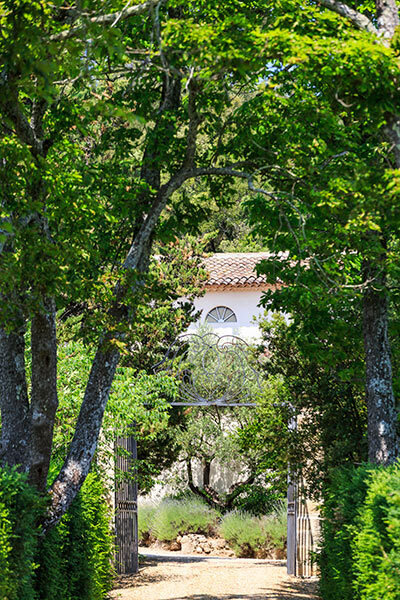 TThe Domaine benefits from the sunshine of the Provençal climate. Irregular, but frequent, winds, help greatly to prevent diseases in the vineyard. Above all else, it is the rain that is the element sometimes lacking. 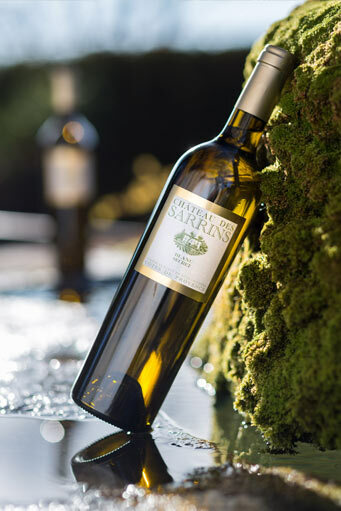 Its location between the sea and The Alps coupled with its altitude, offer Domaine des Sarrins a specific micro-climate within the Mediterranean influence. On the one hand, there is a risk of nocturnal frosts until the end of April, but also a great day / night thermal range, which is 18 to 20°C on average. In summer it is often possible to see 35 ° in the day and 13 ° at night, which is particularly valuable during the harvest. H alf way between the foothills of The Alps and The Mediterranean, Domaine des Sarrins nestles in the hills of Haut Var, near Lorgues, in a small village called Saint Antonin du Var. 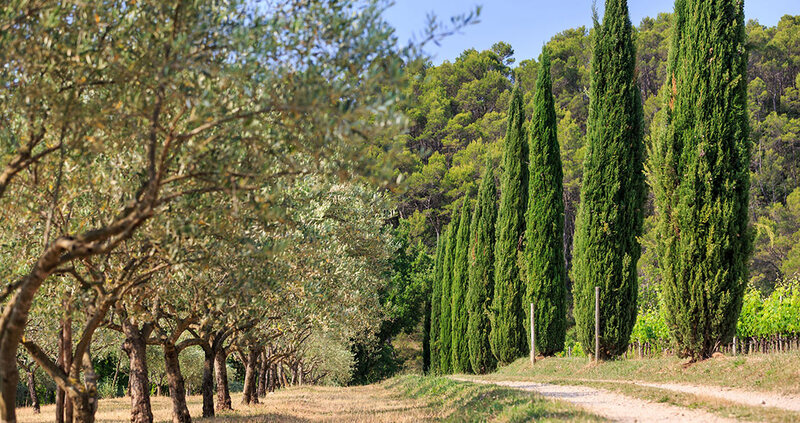 It is set in over a hundred hectares of pine and oak woods and olive groves, which surround small islands of vines, planted where the undulating hills allow. 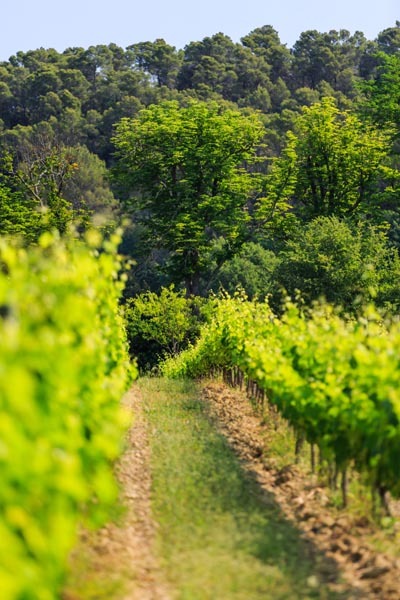 In total, 27 hectares of vines have been cultivated, producing wines under the AOP Côte de Provence or Vin de Pays du Var. The average altitude is about 240 metres above sea level. 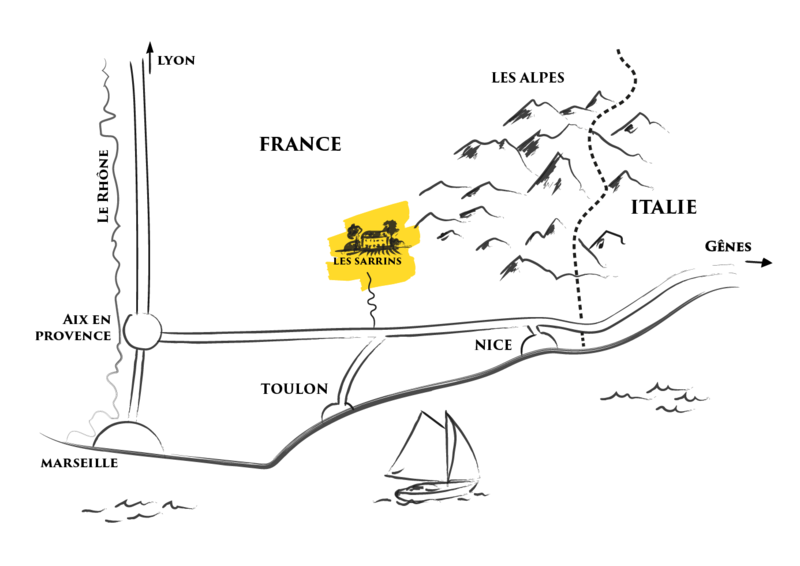 At Domaine des Sarrins, the plots of vineyards are located in clearings in the heart of the wooded hillside. The lower part is Triassic (tertiary) and is essentially composed of gravelly limestone, with some clay areas. These rugged soils do not prevent the vine, a Mediterranean plant, from developing well. A walk through Domaine des Sarrins is via wooded hills, where - around a corner or a hillside - you might come across an oasis of vineyards. Therefore, the 27 hectares of vineyards are divided into about 15 main sites, which can be planted with either one or several grape varieties. 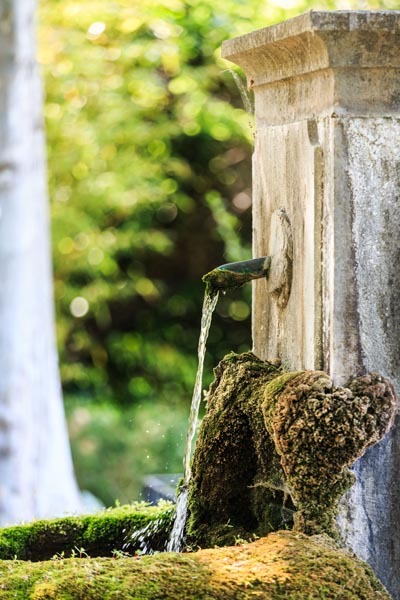 A walk through Domaine des Sarrins is via wooded hills, where - around a corner or a hillside - you might come across an oasis of vineyards. Therefore, the 27 hectares of vineyards are divided into about 15 main sites, which can be planted with either one or several grape varieties. Respect for the land is, for the Paillard family, a philosophy, not a marketing ploy. 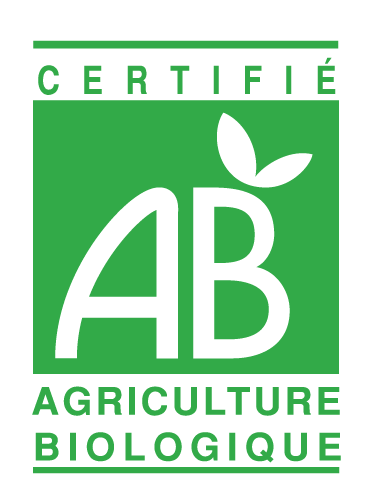 The “organic viticulture” certification is a coherent choice. The vines at Château des Sarrins are therefore all worked without the use of weed killers, with a special focus on ploughing, and the use of certified natural fertilizers only. The certification is discreetly mentioned on the back label of each bottle. Depending on its soil and exposure, each plot is planted with the most appropriate grape variety. 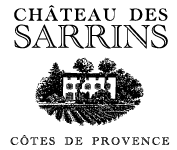 The oldest mourvèdre, grenache, syrah and cabernet sauvignon grapes, which were planted back in the 1960s are reserved for the production of Château des Sarrins Rouge. 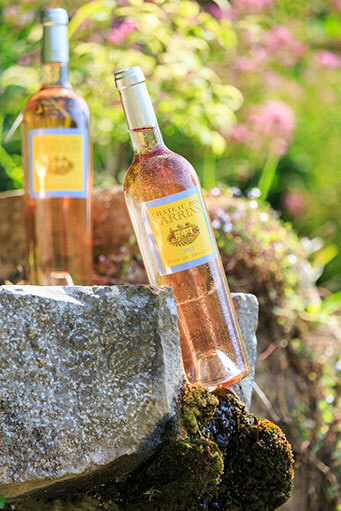 The cinsault, grenache, syrah and the youngest mourvèdres are destined for the production of Château des Sarrins Rosé; whilst the plots of rolle are distributed between the Château Sarrins Rosé, Le Blanc Secret and Le Blanc de Rolle. At the vineyard, the essential period of pruning begins: the genesis of the fruit of the coming years. It is also an opportunity to carry out maintenance: tighten the wires; replace the broken stakes; and put in place ties for the new plantings. In the winery, the red wines finish their malo-lactic fermentation, and are put into 300 litre barrels for a long ageing of close to 20 months. The whites and rosés are taken off their lees and refined; they begin to open to reveal little by little, their personality. It is at the end of the winter that we decide the “assemblages”, which will define each of our cuvées. Pruning is coming to an end and already the soft, early Mediterranean spring awakens the sleeping vine. The canes then grow very fast, and we carry out de-budding to control vigour and create an aerated shape to each vine. These mild temperatures also encourage grass to grow between the rows, which we have to control by ploughing. Depending on the intensity and frequency of rain, observations in the vineyard are essential to know when to trigger those treatments certified in organic farming and therefore protect the vineyard and the quality of the future harvest. It is also time to replace any rootstock which has become too weak. In the cellar it is the best time to bottle the whites and rosés vinified a few months before: the wines have refined and now reveal all their freshness fruity characters, delicately captured in our bottles. At the cellar, we have some time to prepare for the new harvest, and we check all our facilities and ensure everything is perfectly clean so that conditions are just right to welcome the new vintage grapes. In the vineyards, the observations continue through July to ensure the vineyards are perfectly healthy in the run up to the harvest. The maturity of the grapes is followed closely, in order that the harvest can be triggered at just the right time. At the same time, we are setting up our electric fences which keep out the wild boars, very are fond of grapes and numerous in the surrounding Garrigue. It is the height of the harvest, which spreads over a good month, due to the sheer diversity of plots and grape varieties. Each plot is harvested according to its maturity, and the activity in the cellar is intense: pressing the whites and rosés in the freshness of the morning; separating the first pressings which ensures the best juice is selected; precise monitoring of the fermentations; long macerations for the red… The reds of the N-2 vintage are extracted after a long ripening in barrels, then bottled, ready to be tasted. In the vineyards, after harvest, green manure is spread: the growth of selected materials will enrich the soil’s organic matter, when it is buried within. 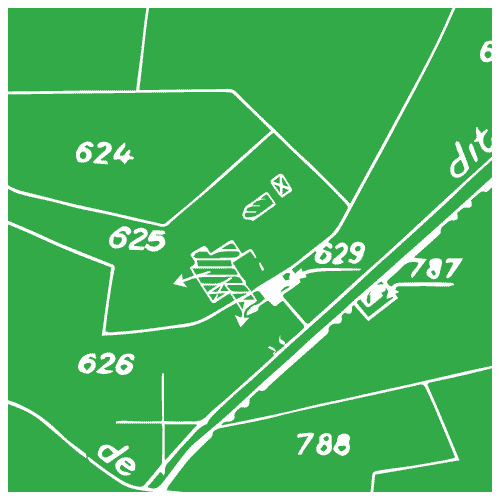 It is also the time to analyse and study each plot to start planning for the coming winter: amendments, planting, reinstallation etc. … And the cycle of our work resumes, whist the vineyard sleeps. Built on the principle of gravity, the Sarrins cellar is discreetly integrated into the landscape, half buried beneath the hill. It has natural insulation and an air conditioning system. This gravity design ensures the grapes are processed gently at all stages. The grapes are directly delivered to the press for the whites and the rosés. For the reds the grapes are, after destemming, poured directly into the vats at the top of the building. The stainless steel vat room is located on the lower level and thus receives – by gravity – the juices from the pressing. The vats are individually thermo-regulated, whilst within the hillside, and the barrel winery where red-ageing and white winemaking are carried out benefits from the freshness of the cellar. Since 1995, certain principles were adopted for all wines produced. 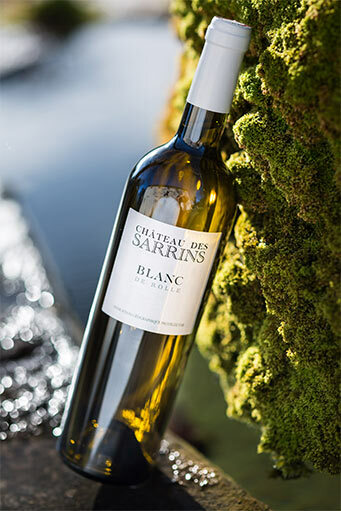 The wines of Domaine des Sarrins are exclusively made from grapes grown and harvested on the estate. Each grape variety and plot is vinified separately, to allow the composition of each of the cuvées. Only the best part of the AOC production is selected – only 18,000 bottles were produced in the first vintage in 1995. Similarly, only the first pressing, the purest, is retained during the blending. To ensure the ideal balance between the maturity of the grapes and liveliness, the harvest of this small estate extends over five to six weeks, depending on the year. Indeed, significant residual sugars or high alcohol levels are the opposite of the signature style of Domaine des Sarrins. Similarly, careful vinification makes it possible to reduce, to the absolute minimum, the doses of sulphite used. Finally time is indispensable when it comes to the creation of great wines, to ensure a domaine’s sense of place; particularly in the long barrel ageing of the reds, but also for some whites and even the Rosé Secret. The average annual production is about 60,000 bottles of which 70% is rosé, 10% is red and 20% is white. It is a qualitative grape with irregular maturity, meaning harvest is completed in two passes. Known in Italy as “Vermentino”, it is used mainly in Bellet or Corsica. The grapes are de-stemmed, then poured into the pneumatic press, by gravity. Pressing, thanks to our latest generation pneumatic press, is slow and delicate. Juice yield is limited to 60%, in order to retain only the best juices with optimum aromatic potential. Fermentation is in wood, in medium toast 300 litre French oak barrels. After the alcoholic fermentation, the wine is left in barrels, on the lees for 10 months ageing in order to develop roundness and aromas. It is regularly “stirred” (to allow resuspension of fine lees). Malolactic fermentation is avoided to allow the wine to retain its freshness and its incredible aging capacity. To the eye, the wine is a limpid, clear, yellow gold.The nose is fine and complex with aromas of exotic fruits (pineapple) and white fruits (pear, peach) with notes of vanilla and acacia flower. The mouth is supple in attack. It reveals a nice balance between freshness and roundness with a long aromatic finish. A fine wine and balanced harmonious palate, combining roundness and freshness with good length. The wine can be served both with Mediterranean and exotic cuisines. It will also accompany goat cheeses or blue cheeses. Nearly two thirds is comprised of Cinsault and Syrah, the last third being Grenache, Mourvèdre and a touch of Rolle. Direct pressing, thanks to our latest generation pneumatic press, is slow and delicate. The yield of juice is limited to 60%, in order to retain only the purest, and to obtain a shade of a very clear, bright pink. The juice is kept in an inert state at all stages to avoid oxidation and to protect the most delicate aromas, reducing the doses of sulphite to a strict minimum. Vinification is in stainless steel tanks at moderate temperatures which are reduced to avoid the malolactic transformation and therefore to keep the beautiful freshness. The appearance is very pale pink in shades of “pomelo”, bright and clear. The nose is fine and intense. It has floral aromas (violet, lily of the valley) and white fruits (peach) with notes of sweet almond. On the palate, the attack is subtle. One finds the finesse of the nose, fresh and harmonious and its floral aromas, as well as a beautiful balance with the freshness. The finish is persistent with notes of violet. More than a “thirst quencher”, this is a great rosé. A fine and balanced wine with an harmonious palate of roundness and freshness, with a beautiful length. The wine wine works well with both Mediterranean and exotic cuisines. The Grapes are harvested by hand from two hectares of old vines planted in the ’60s and ’70s. Two thirds of the blend are Grenache and Syrah, the rest being Mourvèdre, Cabernet Sauvignon and old Carignan. Gastronomic matches: All red meat, game, croustades, truffles, terrines and cheeses. The grapes, harvested by hand, are de-stemmed before being placed in thermoregulated stainless steel vats. During maceration, daily pumping over is carried out. This lasts two weeks before vatting, where only the “vin de goutte” is preserved and transferred to barrels. Ageing is for 24 months in 300litre French oak barrels, followed by blending in stainless steel tank and a rest before bottling in November 2015. Ageing worthy of the greatest wines of the world! To the eye, garnet red, with a ruby red centre.On the Nose, the aromas are a complex mixture of black fruits with notes of leather, spices and garrigue (pine, rosemary, thyme …)On the palate, the wine is harmonious and structured. The tannins, silky, are already well integrated. The roundness of the wine and the notes of red / black fruits give way to a beautiful length in the mouth with spicy nuances. All red meat, game, croustades, truffles, terrines and cheeses. 100 % Rolle. This quality varietal with an unpredictable ripening, will often require two harvest. It is known in Italy as “Vermentino”, which is primary used in the Bellet AOP or in Corsica. Grapes are destemed and gently drop by gravity in a press. Our pneumatic press is part of the newest generation, slow and gentle. The extraction of the must is limited to 60%, to keep only the quintessence and the best aromatique potential. The blanc de Rolle is fermented and aged in thermo-regulated vessels.After the alcoholic-fermentation, the wine is aged on lees, those will bring mouth-feel and flavour to the wine.The malolactic fermentation is avoided, so the wine can preserve its liveliness and its unbelievable aging capacity. To the eye, the wine is of a pale white hue, crystal clear with a bright reflection. To the nose, it is sharp and talkative, bounding mineral notes to some more fresh white fruits (grapes and peaches) and later different hints of sweet almonds and nuts. In mouth, it si harmonious and well balanced between liveliness and roundness. The wine offers a long and fresh finish. General impressions : the wine is well balanced between expressiveness and subtlety with fruit notes, a harmonious mouth freshness and roundness, and a long lasting finish. The wine will fit very well with fish or any sea product, mushrooms, Mediterranean or exotic cuisine, and will accompany most cheeses perfectly. The grapes were sorted then poured into the pneumatic press, by gravity. Pressing, thanks to our latest generation pneumatic press, was slow and gentle. The juice yield was limited to 60%, in order to preserve only the best juice with optimum aromatic potential. 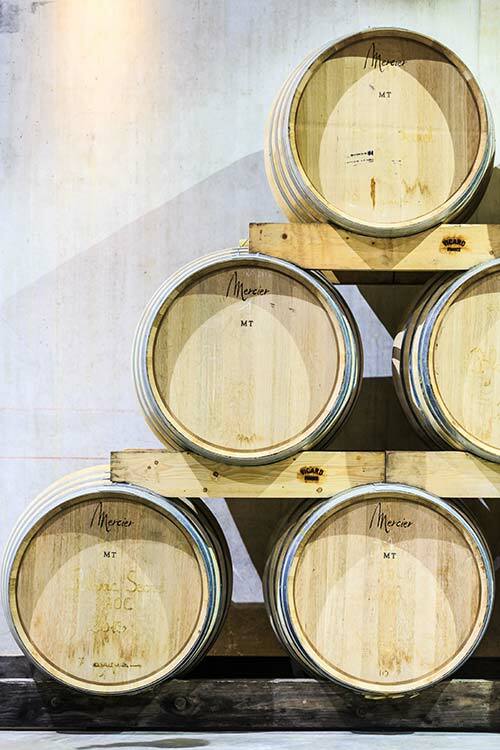 Fermentation was in 300litre French oak barrels, and temperature controlled to preserve the fruit characteristics. After the alcoholic fermentation, the wine was left on the lees in barrels, to age for 10 months in order to gain in roundness and in aromas. It was “stirred” regularly (to shake up the fine lees), according to the technique practiced in Burgundy for the white wines, and that we have mastered in Sarrins for our renowned “Blanc Secret”. The Rosé Secret has a very clear watermelon colour. The nose is fine with aromas of peach, with nuances and notes of spiced brioche and sweet almond. As for the palate, it is supple and balanced, with a nice roundness and light, blended tannins. The length is beautifully long, with richness and without bitterness. A fine and balanced wine, with harmonious palate blending roundness and freshness, with a beautiful persistent aroma. The roundness of the wine will marry well with spicy dishes or grilled fish. It will perfectly accompany langoustine, crab or pan-fried scallops. You understood it, the Domain is good hiding place at the end of a way sneaking between hills. We shall be happy to welcome you in our vault of tasting in the detailed schedules below. Please do not hesitate to book an appointment ! Except these schedules, thank you for booking an appointment. (FR) - Pour visiter le site du Château des Sarrins, vous devez être en âge d'acheter et de consommer de l'alcool selon la législation de votre pays de résidence. En continuant à naviguer sur ce site, vous consentez à notre utilisation de cookies. L'utilisation de cookies améliore votre expérience de navigation. 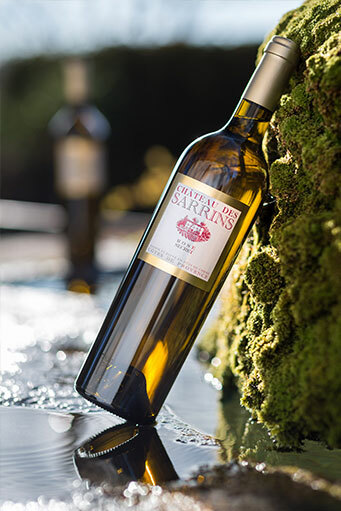 (EN) -To visit the Château des Sarrins website, you must be of legal age to buy and consume alcohol in your country of residence.